What a journey! 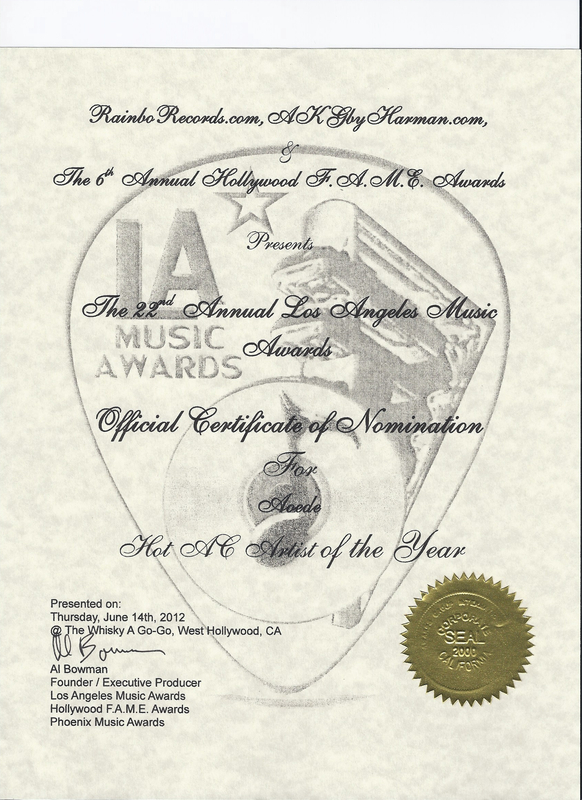 I just returned from Los Angeles, where Aoede was officially nominated for 2012 LA Music Awards for a category called Hot AC (Adult Contemporary) Artist of the Year! This is amazing to me as Aoede won 4 awards over the past 5 months, 2 for Artists in Music in February and 2 for Indie Music Channel in April. What an honor to receive recognition for such hard work and for my musical expression! To receive such accolades while facing such a debilitating condition as DM gives me hope and inspires me. I like that it is all about the music. It shows me that I can still pursue my dreams and make them come true, even if I may not do it in the same fashion as other singer-songwriters. Just last Sunday, I put on a special event to celebrate Aoede’s new album release for Skeletons of the Muse and music video premiere for Fairy Tale Love. This event had many milestones for multiple reasons. First, it was my first public performance in nearly a year. The primary issues I continue to face having Dermatomyositis are fatigue, stamina and weakness. Putting on a show can be quite energy intensive, from all of the prep work, arranging the venue, line-up and rehearsals, promoting, to the show itself. To add to my challenges this time, I chose to do something I have never done: combine media and present what I called The Fairy Tale Love Song Cycle, revolving around the theme of my new music video, and the song themes on my new album: love, reflections, skeletons and lights. It was basically a combination of readings, video, and live performance. All of these elements required a lot of preparation, such as writing my fairy tales, putting a video together that synched with the readings, arranging rehearsals, etc. The week of the event, I was crazy exhausted, understandably. This was another milestone for me, just putting on the show in a format I had never tried. To prepare the set, Dave made an enormous metal tree from which we hung paper art-the same art used in the music video-and decorated it with other fairy tale props. I handmade little Fairy Tale books that people could buy to take home part of the evening and my stories. For part of the show, I dressed up in a fairy tale/princess dress and gave behind the scenes look at Fairy Tale Love video. The next huge milestone for me was singing. Pre-DM, When I used to play regular shows, I would have my acoustic or electric guitar and play and sing with Dave or with other configurations. 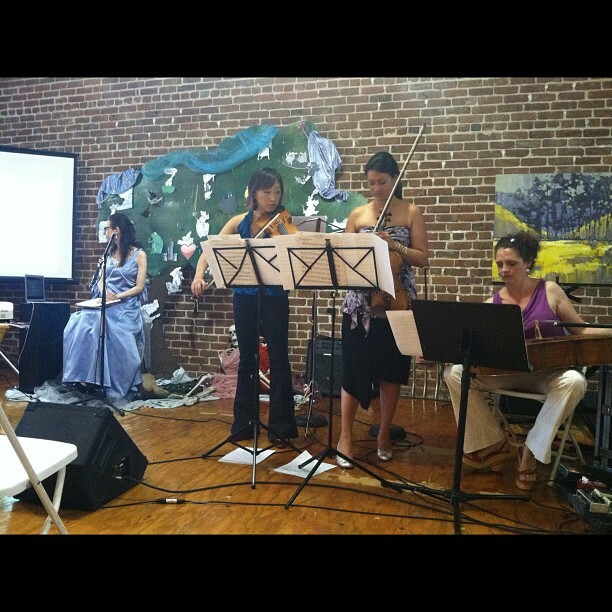 For this show, I had full ensemble, including drums, bass, keyboard, guitar, and two backup vocalists, as well as an ensemble of strings (pictured left). I was free to just sing and play with the props and interact with the audience. It was very freeing, and I found that although my energy faded throughout the evening, and I had to sit for part of the performance, I was able to stand and sing for some songs, even dance a little and really put myself into expressing the songs. I felt some sort of a breakthrough. Before the show, perhaps I was a little anxious about performing, since I was so confident and strong pre-DM. I didn’t have to think about consistency or whether I would need to sit, or what my energy would do on that particular day. Putting on this show helped me get over some of this anxiety. It was very well received. People came up to me afterwards and said they were moved and enchanted. Everyone wanted to know when we would be putting this on again! As I noted, due to DM, I haven’t been doing much public performance during these past few years, and instead I have focused my limited energy on writing, recording, completing and releasing an album and music video, a successful fundraising effort through Kickstarter, and licensing Aoede’s music, as well as connecting through online social networks. However, Aoede has been asked and agreed to be part of the CureJM Fundraiser in Portland, OR in August. This special concert-CureKids Jam and Festival-is near and dear to my heart. JM is Juvenile Myositis. Just like in Adult DM, there is no cure for JM yet, but there are treatment options to help manage the symptoms-primarily muscle weakness and rash if JDM. This concert will raise funds for JM. The Cure JM Foundation (Cure JM) is a 501(c)(3) non-profit organization dedicated to finding a cure for JM, while also providing support and information for families affected by JM. Cure JM is continually striving to raise awareness about the disease and to secure critical funding for research efforts aimed at finding a cure for JM. I am privileged to be included along with other talented artists Blake Lewis and Jessica Lerner. My hope is that seeing me, someone who shares their disease, tell my story and perform can inspire the kids and give them hope for their own futures.